Home » How To Get More Traffic To Your Website or Blog? How To Get More Traffic To Your Website or Blog? I get asked a lot about how to get more traffic to your website or blog so today I'm gonna share some tips for you. One of the things I love to show people is how to get more traffic. If you have a website or your blog, I'm going to share with you three quick tips on how to can get more traffic to your website or if you're a blogger, this may help you get more website traffic to your blog. Understand that these tips are what I've learned from Russell Brunson and it has helped me get more traffic to my website and I want to share that with you as well. There are three types of traffic. Traffic that you can control, traffic that you cannot control, and then traffic that you own. Starting with the traffic that you control. This is paid advertising. There are some people who are against this type of traffic, but there are some people who will only use this way to drive traffic, and increase website traffic fast. Thats beauty of it, it is an on-off switch, but if you are not following the rules of the advertising, say, for example, like Facebook or Twitter or something like that, then they can ban you off. This is traffic that you control, you pay a platform a certain amount of money, and are driving instant website traffic. Organic traffic. This is the traffic that everybody wants. The problem with this is that it takes a little bit longer. People want to how to increase website traffic for free, most people don't really want to pay for traffic. They want the free traffic, but if you're not consistent, you're not going to get the organic traffic that you're looking for. A tip on this is that if you do a little keyword research on what people are talking about. That will help on how to increase website traffic through google but it is a long-term strategy. It's what everybody wants, but don't want to put in the time to actually get there, so keep that in mind that if you want to get traffic to your website free and you cannot control, which is the free traffic, it takes a while. 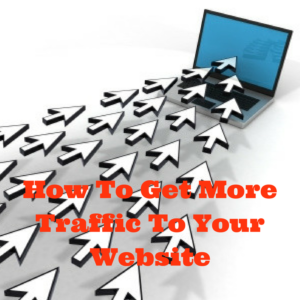 How to get traffic to your website fast, is traffic that you own. Now if you have a website or you have a blog, the main thing you should be doing is getting leads. From those leads you are building a list. Once you have a list of your target market, you can build relationships with and connect and sell my products to them. Once you have that traffic that you own, you can send them value information. Examples are value based content, selling products, event you are putting on or attending. You can send that out to your audience because you own it. That's going to increase website traffic fast. If you are building, get more traffic to your website, you should be building a list, to traffic that you own. Was this helpful? Hopefully I kept it simple and understandable, feel free to share if you got value and let me know if you like me talking marketing on this blog in the comments below.